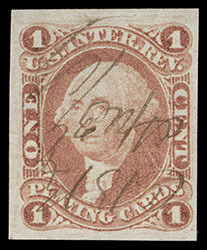 Revenue, 1862, First Issue, 1¢ Playing Cards, imperf, neat manuscript cancel, ample to mostly large margins, bright vibrant color, light pressed horizontal crease not detracting, Very Fine and choice appearance, a handsome example of this very scarce revenue issue. 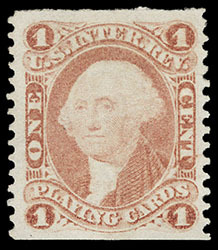 Revenue, 1862, First Issue, 1¢ Playing Cards, part perf, without gum, choice centering, bright and fresh with strong vivid color, Very Fine and choice, one of the very few unused examples extant, with Scott catalog value for used, ex-Joyce. A RARE UNUSED EXAMPLE OF THE 1¢ PLAYING CARDS PART PERF ISSUE. 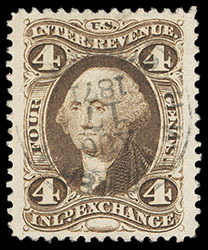 Revenue, 1862, First Issue, 1¢ Proprietary, imperf, light unobtrusive manuscript cancel, full well proportioned margins, rich bright color, small fill thin at upper right, Extremely Fine appearance, a lovely example of this scarce issue. 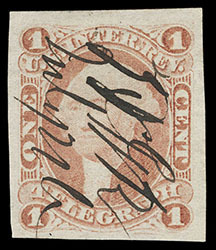 Revenue, 1862, First Issue, 1¢ Telegraph, imperf, manuscript cancel, large to huge margins, strong bright color, Extremely Fine, rarely encountered so large. 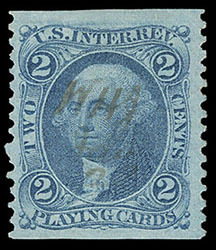 Revenue, 1862, First Issue, 2¢ Playing Cards, blue, part perf, neat manuscript cancel, rich color and wide margins, Very Fine and attractive. 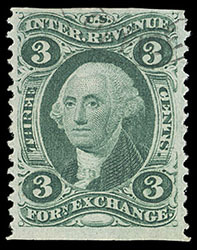 Revenue, 1862, First Issue, 3¢ Foreign Exchange, part perf, light face free circular date stamp cancel, rich color, Very Fine, an attractive example. 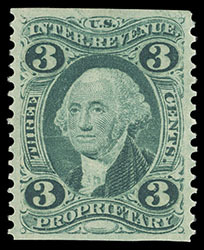 Revenue, 1862, First Issue, 3¢ Proprietary, part perf, without gum, beautifully centered amid well balanced margins, rich vibrant color, Extremely Fine, one of only a few unused examples known, Scott catalog value for used. A CHOICE UNUSED EXAMPLE OF THE 3¢ PROPRIETARY PART PERF ISSUE. 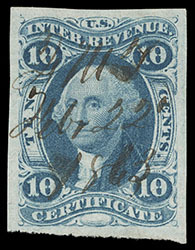 Revenue, 1863, First Issue, 4¢ Inland Exchange, perf'd, silk paper, showing numerous blue silk fibers on front and reverse, light 1871 circular date stamp cancel, choice centering amid wide margins, rich bold color, an Extremely Fine gem, a stunning example of this elusive paper variety; with 2002 P.F. certificate. 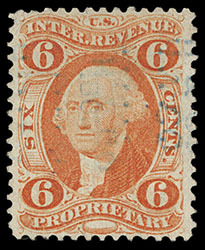 Revenue, 1871, First Issue, 6¢ Proprietary, perf'd, light blue handstamp cancel, choice centering for this notoriously off centered issue, rich radiant color and crisp proof-like impression, Very Fine and choice, an exceptional example of this difficult issue, Scott catalog value for fine centering with minor non-detracting flaws. A STUNNING SOUND EXAMPLE OF THE 6¢ PROPRIETARY ISSUE. 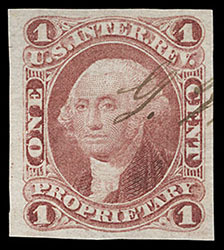 Revenue, 1862, First Issue, 10¢ Certificate, imperf, neat 1863 manuscript cancel, large beautifully balanced margins all around, rich color on bright fresh paper, an Extremely Fine gem, a stunning large margin stamp.